Jesse James, Sandra Bullock’s ex-husband, has shared his first personal picture from his wedding day to Alexis DeJoria. In the image posted on Twitter, Jesse James smiles widely as his bride wraps her hand around the back of his neck, both gazing into the camera lens. The snap – released on Monday – appears to be an amateur self-portrait taken by Jesse James with the sun in the background bursting though the many trees and lighting up her veil. Alongside the image Jesse James posted a caption which suggests his latest woman completes his life. Jesse James appears with his greying hair slicked back while the close-up shot shows Alexis DeJoria’s brunette tresses in a wavy style with the front pinned away from her face. Tattooed bride Alexis DeJoria dons a friendship bracelet on her left arm and she wears minimal make-up on her big day. 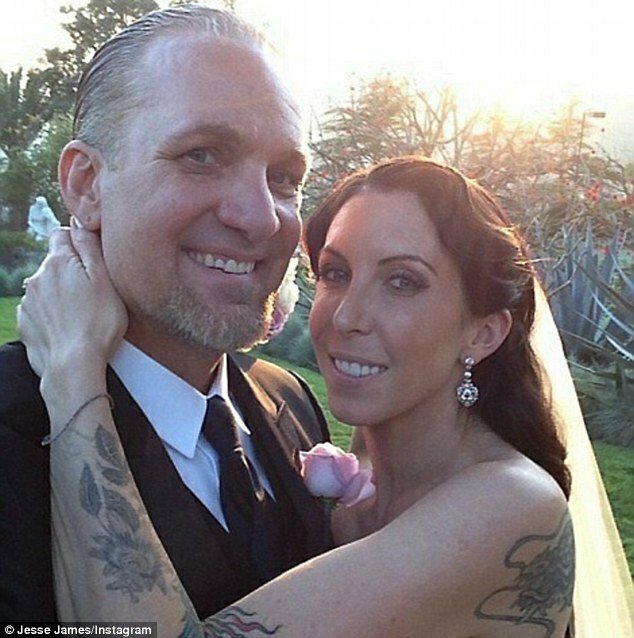 Jesse James married Alexis DeJoria in a very extravagant and expensive affair in Malibu on Sunday.